I grew up in Saratoga Springs, NY where my first loves were frogs and hiking in the Adirondacks. I owe a debt of gratitude to Dr. Monica Raveret-Richter of Skidmore College for it was during her ecology course that I spent freezing winter days observing woodpeckers and nuthatches, which sparked my journey into the avian world. My interest in raptors began as a bald eagle nest watcher for the New York State Department of Environmental Conservation under the mentorship of Pete Nye. I volunteered for the Peace Corps in Niger in 1995. In 2000 I moved to Kenya to undertake research for my Master’s degree, and later studied Mackinder’s Eagle Owls for my PhD research. Much of my current focus is on the conservation of vultures. I am particularly passionate about curbing the widespread use of highly toxic pesticides to kill wildlife. My other passion is tackling the illegal trafficking of owl eggs for belief-based uses in East Africa. 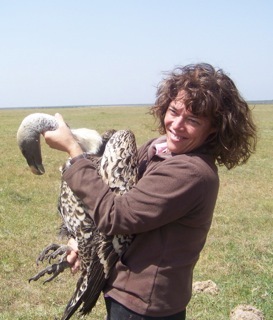 I am co-Editor of Scopus, East Africa’s peer-reviewed ornithological journal, and I co-Chair the African Region of the IUCN Vulture Specialist Group. I’m actively involved in a host of local conservation issues as a member of Nature Kenya’s Bird Committee and the Kenya Wildlife Service Bird Taskforce. I currently mentor and gain inspiration from the next generation of East African conservationists. With the world becoming an increasingly crowded place, the conservation challenges magnify with each generation.